For many children, college will be one of the most influential experiences of their lives. It's where they'll expand their minds, discover who they are, gain knowledge, and begin to build a future. It's also expensive. That's why saving now is so important. Check out these 3 tips. One, start early. Like with any goal, the earlier you save, the better. The longer you keep your money invested, the more time it has to add up and potentially grow. Why's that? Introducing the power of compounding. Compounding happens when you continually reinvest your returns, and those returns earn more returns and so on. To demonstrate, let's look at a hypothetical example. Let's say you set aside $1,200 a year, or $100 a month in a tax-free account such as a 529 college savings plan. That's a total investment of $21,600 over 18 years. But if your account earns 5% a year, you'll actually have about $35,400 at the end of 18 years. Legal note: This hypothetical example doesn't represent the performance of any particular investment. The ending balance doesn't take into account any taxes that may be due. Earnings on nonqualified withdrawals may be subject to federal income tax and a 10% federal penalty tax, as well as state and local income taxes. The availability of tax or other benefits may be contingent on meeting other requirements. That's a big difference. Save now and thank yourself later. Two, invest regularly. It's not enough to save early. It also helps to invest often. A lot of 529 plans offer ways to automate your savings, which makes it easy. Consider setting up a schedule for moving money between your bank account and your 529 account with an automatic investment plan. Or if your employer offers payroll deduction, you can save for college with every paycheck. Let's look at why it pays to invest regularly. Remember that $100 you were setting aside each month. Legal note: A plan of regular investment cannot assure a profit or protect against a loss in a declining market. What happens if you forget to do so for say 3 months out of the year. Instead of putting aside $1,200 a year, you were saving $900. If you consistently miss investments over the years, you may wind up with more than $9,000 less. Avoid missing a beat by saving automatically, you'll be regularly adding to your account without even thinking about it. Three, focus on the long term. One of the best ways to achieve your goal is to see the big picture. Of course, it's a good idea to take a look at where your college savings are invested once a year to make sure they reflect the amount of risk you're comfortable with and your child's age. If you need help, we've got lots of tools to help you with your strategy. When markets are volatile, it's easy to get caught up. For example, if you invest in stocks you can expect some downturns. Don't panic or get market jitters. If you rashly swap investments during a downswing, not only could you lose any money gained, but you could lose out on the potential upswing. In the long term, that setback is just a blip on the radar. It's important not to let your emotions take hold of your investment strategy. That strategy is unique to your situation. Having a plan and sticking with it could keep you from making costly mistakes based on short term events. 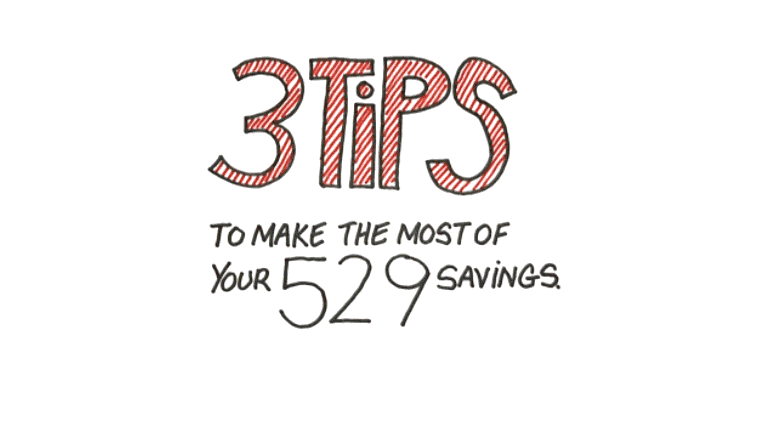 And that about wraps up our 3 tips for making the most of your 529 savings.